The ketogenic diet plan has been recognized by many authorities on nutrition and weight loss. It is proven by the population who already uses the method and have successfully dropped pounds and inches. You will soon discover you don’t need to give up your bread and dessert choices! You can choose from healthy and delicious bread, sweet bread, biscuits, rolls, flatbread, breadsticks, muffins, crackers, and more. You will also have the portions calculated with the nutritional facts listed for each one including the Net Carbs, Protein, Total Fat, and calories. Prepare each of the delicious options without guilt and aggravation of having to do the math! 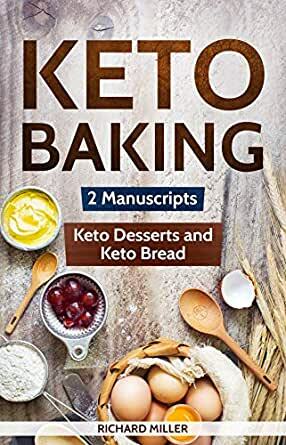 These are just a few of the topics covered in Keto Baking. Each of the recipes provided has step-by-step instructions so you can relax and enjoy your new baking experience. Add this ‘must have’ book to your personal library today and start baking tonight! Well written, difficult subject matter clearly explained, my wife and i are loving cooking together, recipes are worth it alone, this is a paradigm shift in the way you use food, I’m absolutely loving it. Clearly layer out, easy to follow, big time learning experience. This is best for beginners keto guide with step by step tips with elaborate instruction to follow. All of the information with step by step guide was very helpful for me. The book is very well written. I am read this book fully twice, then I get the benefit really. Desserts are delicious and the instruction was clear to follow. And for the first time I am able to made the deserts perfectly as the book shows. And I am really happy to have that cookbook. I feel really good to follow this guide. One of the hardest things for people going on a keto diet is giving up dessert. Delicious and easy to prepare. My whole family loves these desserts, not just those of us on the Keto Diet. I’m able to share with everyone. 5.0 out of 5 starsExcellent recipes for me. This book has part of data on this well book.Very simple and best Keto Baking 2 Manuscripts on this extraordinary book.My mother likewise like and Follow this well book.Easy to pursue this book recipes.I have attempted the Salted caramel pralines which are beyond words thus simple.I love that Urvashi thinks of such simple and straight forward recipes.Overall incredible book for us.